Retrieve Wylandriah's spoon, ingot, and soul gem. Help Wylandriah retrieve some lost items. After asking Wylandriah if she needs help she will enlist your aid to help retrieve some items she accidentally left behind while on her travels. She needs these implements to perform an oddly-inspired experiment. All items can be found in unique containers labelled "Wylandriah's Satchel". Wylandriah's Spoon Ivarstead Fellstar Farm On the table. Wylandriah's Soul Gem Windhelm The White Phial Behind the staircase, on top of a barrel. Orichalcum Ingot Winterhold The Frozen Hearth On a bookshelf in the main room. Wylandriah's items can be acquired in any order. To find the spoon, go to Ivarstead and enter Fellstar Farm's house. Wylandriah's satchel is sitting on a table. 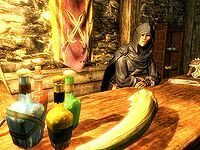 To find the soul gem, go to The White Phial in the market in Windhelm. There are two barrels under the staircase; Wylandriah's satchel is on top of the barrel closest to the door. To find the orichalcum ingot, go to The Frozen Hearth in Winterhold right across from the jarl's longhouse. Wylandriah's satchel is on the bookshelf with the elves ear plants next to Nelacar's room. Return to Wylandriah with the items and she will give you several random scrolls as a reward, but will have no recollection of actually setting you on the task. The orichalcum ingot is a special quest version found only in her satchel, but not named like the other two items. Fellstar Farm is locked during the day, so you may want to enter at night if you don't want to risk getting caught trespassing. Or, if you are trying to maintain a good character, you can wait until the family stops working in the garden. Then, one by one, they will enter the house. The mother is the last one to enter the house. After she enters, the house becomes unlocked, and you can enter the house without trespassing. If you pick up one of the items before engaging in the quest, Wylandriah may not ask this favor. Finding all three should trigger an update and allow them to be turned in though. Wylandriah's Soul Gem is fillable, and despite being a quest item it can be used to recharge enchanted weapons. Using the gem to recharge enchanted weapons will consume the gem thus making the quest impossible to complete. In some cases the items will not show up when you search the satchels, making the quest impossible to complete. The following empty quest stages were omitted from the table: 10, 200, 250. On the PC, it is possible to use the console to advance through the quest by entering setstage FreeformRiften14 stage, where stage is the number of the stage you wish to complete. It is not possible to un-complete (i.e. go back) quest stages, but it is possible to clear all stages of the quest using resetquest FreeformRiften14. Esta página foi modificada pela última vez à(s) 21h30min de 17 de outubro de 2014.